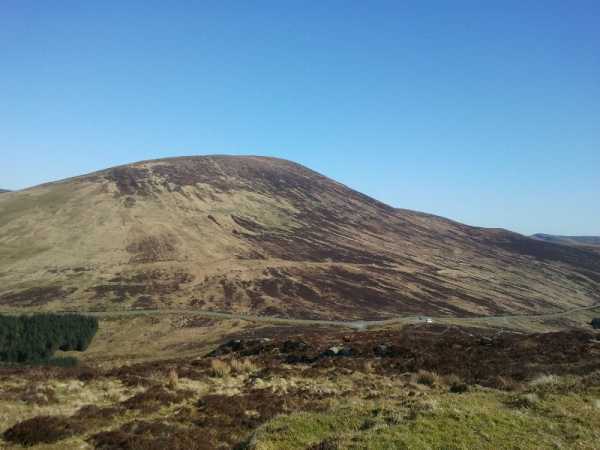 We picked up the track to Camaderry on the E side of Turlough Hill and followed it all the way SE to the top of Camaderry. While an enjoyable summit, it does not give the same enjoyment as the more easterly top. We therefore carried on SE along the established path to T09041 97337 A where there is a little cairn on the top of '667'. Do walk a little further east so as to enjoy the near 360 degree panorama that can be seen from the NW clockwise to E and right around to the SW. There is not to much evidence of errosion and thankfully little rubbish! We started from the Upper Car Park in Glendalough and made our way around the right hand side of the lake to the old mines. 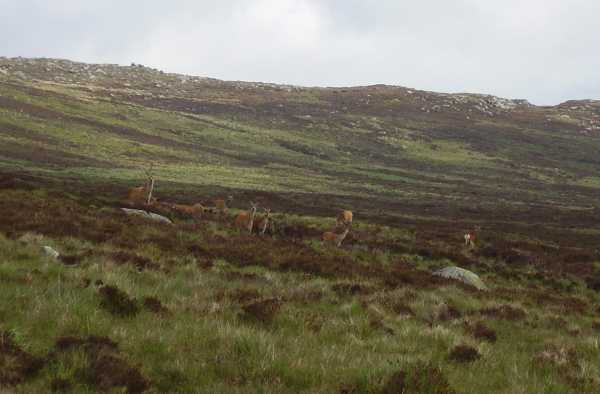 Quite a few deer can be seen on the lower part of the climb. The route up is fairly straightforward (although soggy underfoot at this time of year) – just continue along the banks of the Glenealo river. You will pass a nice wooden bridge crossing the river but it is best to stay on the right hand side. Shortly after the stream dies out, begin to veer to the right towards Turlough Hill. Some nice scenery can be seen as you head towards the fenced reservoir, however, you will find a maze of peaty hags to negotiate which, unless luck is on your side means getting mucky ankles. Once you approach the fenced area take the southern route around and again negotiate some hags towards the summit of Camaderry. The summit is quite level and the cairn is not the most apparent at first. It is aournd here where we begun to meet several other climbers coming in the opposite direction. From here it is a short walk over to the second lower cairn. The scenery from here was spectacular and definitely worth taking the camera out of the bag for. Beautiful Monday morning starting out in the Upper Lake Car Park of Glendalough. The mist was still rising from the lake because it was only just bright. But it ended up being one of the hottest days of the year so far - 19 degrees for March 27th is pretty good. We even got to see the peaks of Snowdonia in Wales from Camaderry - first time for me to see Wales from Ireland. I got some of this route from the Mountain Views list of tracks - see Ireland, Tomaneena, Dublin/Wicklow - Thanks to march-fixer. The walk starts from Glendalough upper lake car park. 4 euro needed to park there - make sure you have the change. From the car park, walk back towards the entrance and take a left towards the Education centre which is down the road beside the lake at 50 metres. Just after the Education Centre turn right to take the track uphill towards Camaderry. It's a big track at the beginning and easy to find all the way up. Still grassy though and not worn. Up to Camaderry is a nice easy walk but was pretty warm with the sun on our backs coming up from the East. There was no wind even at the top. 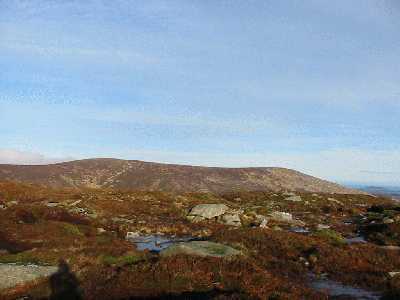 The first cairn was Camaderry East at 677 metres. Altimeter reading 675 - pretty close. We even got to see the peaks of Snowdonia in Wales from Camaderry - first time for me to see Wales from Ireland - must be about 140 km to Snowdon from the Wicklow mountains. Then headed North West to Camaderry itself which is about 25 metres higher. From Camaderry we could see Lugnaquilla on the far side of the Glenmalure valley. 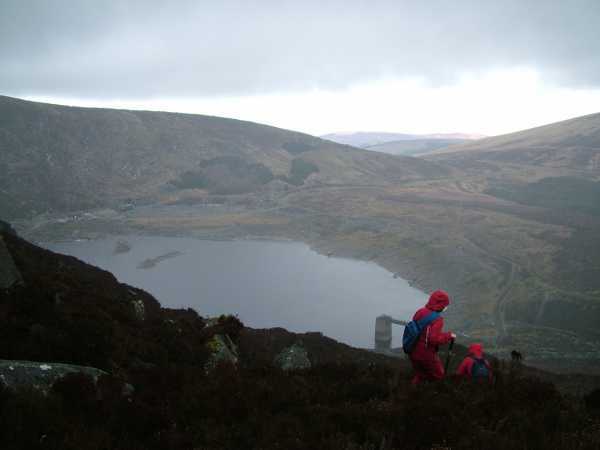 Our next target was Turlough Hill reservoir. Lots of activity there cars and vans coming up and down the road. We would love to have gotten a tour. There's a similar hydro-electic project over in Wales which is open to tourists. A tour would be fascinating for kids ( and me!) and give them an interest in engineering. How about it? - Electric Ireland!